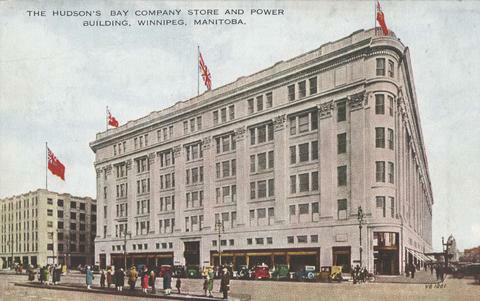 Item consists of a postcard in printed format that shows the HBC Department Store "the Bay" at Portage Avenue and Memorial Boulevard. The Power Building appears at left-side of postcard. Published by Valentine Edy Company, Limited, Winnipeg, Manitoba. Printed in Great Britain. Date of postcard is unknown.